The distal tibia is the preferred level for rotational osteotomies of the tibia. 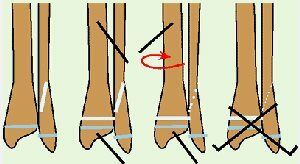 Rotational osteotomies may be performed for idiopathic tibial torsion, torsion associated with neuromuscular disorders, or occasionally torsion in clubfeet. Tibial torsion is rotation falling beyond the range of normal. The thigh-foot angle usually exceeds 35°–40°. Because rotation changes with growth, delay rotation osteotomies until after 8–10 years. Bilateral procedures may be performed at one time. In the older child, performing one procedure at a time allows the child to crutch walk during recovery. Prep to the hip and use a sterile tourniquet to help assess the TFA during rotation. Using fluoroscopy, mark on the skin the sites of the growth plate and about 2–3 cm more proximal for the site of the tibial osteotomy. Make an 8-cm anterolateral longitudinal skin incision and expose the tibia proximal to the growth plate. If deformity is severe, expose the shaft of the fibula more proximal and perform an oblique fibular osteotomy. Place two smooth parallel K wires proximal and distal to the osteotomy site to monitor the rotational correction. Perform a transverse tibial osteotomy with a power saw. Rotate the distal segment while observing the relative position of the K wires. Once the amount of correction is achieved, transfix the tibial osteotomy with two smooth percutaneous K wires. Bend the ends over to prevent migration. An alternative is to fixation with crossed pins is fixation with a plate. Apply a long-leg cast with the knee flexed about 20°. Bivalve the cast to accommodate swelling. Monitor neurovascular status during the early postoperative period. At 4 weeks, apply a walker and allow weight bearing. Remove the cast and K wires in the clinic at 7–8 weeks. Malrotation Avoid this complication by careful preoperative assessment, intraoperative monitoring of correction, and securing stable fixation. Compartment syndrome This complication is avoided by operating distal to the compartment, splitting the cast, and monitoring clinical findings during the early postoperative period. Nonunion This is most common in the fibula. Avoid this problem by avoiding any soft tissue interposition following the osteotomy. If the fragments are widely separated, they may be approximated by a heavy absorbable suture.